A tasty, handheld treat! 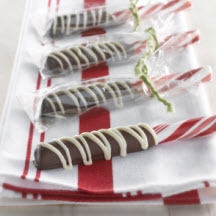 Traditional peppermint sticks, dipped with chocolate and decorated with white morsels, are perfect for gift-giving or a festive holiday treat. Microwave white morsels in small, heavy-duty plastic bag on MEDIUM-HIGH (70%) power for 20 seconds; knead. Microwave at additional 10- to 15-second intervals, kneading until smooth. Cut tiny corner from each bag. Squeeze to drizzle over ends of already dipped candy sticks. Let stand until set. Insert candy sticks into bags and secure with ties. Store at room temperature.